drove the Campbell Special in 1961-62. This was one of the first successful Chevy V8 powered mid-engined sports/racing cars. Harris qualified the car for the 1961 Riverside GP but had to drive conservatively because of a magneto problem. He finished 13th. On September 2, 1962, Harris crashed at the modified Santa Barbara airport circuit. As today's kids would say, he got "major air" in a spectacular flying, spinning rollover. The car was rebuilt by Campbell and raced in 1963 by Jim Parkinson. Where is this very significant car today? 8-22-05: The Campbell Special, owned, restored, and driven, by Tom Mittler re-appeared at the 2005 Monterey Historics! Harris at Riverside. Judging from subsequent performance, he could have challenged the leaders. Note "long tail" configuration in this photo and below. When the car appeared for the 1962 season the tail was chopped short. Stirling Moss in the Lotus Mk.19 passes Harris in Turn 6 during the 1961 L.A. Times Grand Prix" at Riverside. Bill Campbell (leaning on roll bar) talks to Harris (sunglasses) and Dave MacDonald at Riverside in March, 1962. The big man in the blue hat could be Dan Blocker, "Hoss" on TV's "Bonanza" series. Blocker was a sponsor and crew member with the Campbell effort. He later created the "Vinegaroon" team that first raced the ex-Bill Krause Elva Mk.6-Maserati and then a very potent Genie-Chevy. Can anyone identify any others here? "The man in the blue shirt is Santee creator Fred Puhn. "I noticed in your March '62 photo of Bill Campbell and Bob Harris at Riverside you asked if anyone could identify others in the photo. The man in the grey checkered shirt talking with Bob and Bill is my father, Dave MacDonald. Great site!" At this legendary Riverside event Harris dueled Dave MacDonald in his "00" Special for the lead in one of Riverside's most famous battles. The two traded the lead frequently and lapped quickly enough to have been competitive in the 1961 Riverside GP a few months earlier. MacDonald won when Harris lost fuel pressure. "I was 15 years old in September of 1962 at the Santa Barbara Road Races with my 14 year old brother. We were sitting at the edge of the picket/crowd control fence just north of the Turn One grandstands. I was looking down towards Turn Two when I heard this loud screeching of tires. I turned to look and saw the Campbell Special sliding sideways into the ditch that ran out from under the culvert just past turn one. The car went airborne and there was so much dust and dirt flying..............I was looking up and could see the driver hanging by his seat belts and his arms seemed to be grabbing for the steering wheel. The car landed with a loud thud not more then 8 feet in front of us. The driver was trapped underneath and struggling to get out. The car's radiator was hissing and steaming. Course workers were at the crash scene in no time and it seemed like it was about six guys that turned the car over and got the driver out. The event was so startling that to this day, 46 years later, I remember it as if it happened yesterday. 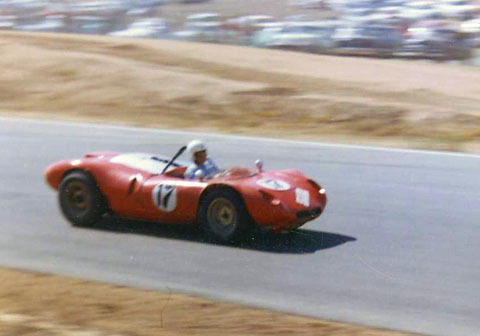 I have some fond memories of the Santa Barbara Road Races; Dave McDonald and Ken Miles driving their Cobras; the Washburn Cheverolet #614 Corvettes; the first XKE Jag and the Lance Reventlow Scarab and Old Yeller. Dangerous times to race but exciting for a kid." Thanks for putting together this terrific site for us old farts who were teenagers back in the '60's and have fond (but fading) memories of Southern Cal road racing. I lived right across the street from Bill Campbell in Burbank and spent endless hours in his garage "helping" him with his various cars and my dad and I were regulars at the Southern Cal races Bill took the cars to. We were right there in that turn at Goleta when Bobby Harris nearly killed himself and destroyed the Campbel Special. Bill had just installed special gas tanks on the car in preparation for the upcoming Times Grand Prix at Riverside where they at one time held the overall track record. He'd asked Bobby to take it easy since Goleta was to be primarily a "shakedown cruise" to work out any kinks in the car prior to Riverside. After the crash, Billy was so discouraged that the car sat in his garage for months before he started putting it back together. Bobby hit those hay bales so hard that the exhaust pipes/headers (they were modified boat drag racing units) had straw jammed (and I mean jammed) right up to the exhaust ports. I know because Bill gave me the task of cleaning them out with a bent welding rod, a process that took hours to complete. After the car got put back together, they raced it with Jim Parkinson driving and then for some reason Billy sold the car. He then picked up an old 1950's vintage Kurtis Kraft sports car chassis and convinced a very nervous Parkinson, a car dealer, to loan him an XKE drophead which Bill used for a positive mold to pull a fiberglass body. He got the body on the Kurtis, painted it green and called it "The Alligator." They raced that one with middling success and then after a while Bill dumped that car and ended up with an engineless Porsche RSK. He dropped in a 301 Chevy feeding a Pontiac Tempest transaxle that Mickey Thompson had run at Daytona and Bill eventually got the RSK licensed for the street. About that time Dan Blocker had bought a Bizzarini that he subsequently spent $5,000 on (a not insignificant amount in 1966) at Bill Thomas Racing for a 400 HP Chevy engine and some suspension mods. Dan was driving the Bizzarini back from New Mexico when he decided to take it up to around 170 to the delight of the New Mexico Highway Patrol which set up a road block in his honor. The car was impounded and Dan lost his license. Governor Pat Brown got Dan's license back on the condition that he sell the car so Bill Campbell bought it and drove it around for a while which was a cool thing to have parked across the street from my parent's house. A side benefit to hanging out in Campbell's garage was that Bill got Blocker, who'd taught drama and math at Glendale High School, to help me with my Algebra which took me from nearly flunking to a B+. Campbell's fabricator was a film editor named Gilbert Hudson who could make anything. Gilbert was a drinking buddy of Carroll Shelby and one afternoon Gilbert shows up at Bill Cambell's house with Shelby in the very first Cobra which was sporting an unpainted raw aluminum body. That was a pretty cool experience, seeing that car (which I hadn't even heard of at the time) and meeting Shelby who I did know had won LeMans. A couple years later Gilbert fabricated a Ferrari-style egg crate grill for his '64-1/2 Mustang which got so much interest that he started up production and ended up making a small fortune off those grills. Anyway, those were wonderful days for me and thanks for the effort you put into the site. It's terrific." "I forgot to mention that Jim Parkinson, Dan Blocker and I were hanging out in Bill Campbell's home garage (the only place his race cars were housed and prepared) doing some last minute work on The Alligator the Friday night before its first race. Bill had gotten it primered but had forgotten the green paint back at the Campbell Hulls boat shop in Glendale and the SCCA wouldn't allow a primered car to race. For some reason Bill had a key to the shop but not to the front gate so he gave me the shop key and asked Dan to take me down there, the plan being for me to hop the fence, open the shop, and fetch the paint. With Chevy being the sponsor for "Bonanza" , Dan was kept knee deep in Corvettes but his favorite car at the time was a British racing green Austin Healey 3000 with chromed wires which we took down to Campbell Hulls, arriving around midnight. Dan left the engine running and lights on as I crawled over the front gate. I unlocked the front door, grabbed what was needed, locked the shop back up, threw the paint and some reducer over the fence to Dan, scurrried back over and we took off. Unfortunately we only made it about 2 blocks before a police car pulled us over. The two cops approached with guns drawn, positive they'd just witnessed a robbery. They ordered us out of the car which is when I discovered it ain't easy exiting a Healey 3000 with your hands held high. The cops were ready to slap the cuffs on us when one of them took a good look at Dan and finally asked to see his license which immediately diffused the situation. The cops left laughing but Dan and I were quite shaken, resulting in a very quiet ride back to Campbell's house where, needless to say, everybody else thought the incident was funny as hell. In any event, the car got its coat of green paint and made it to the race which, I think, was at Willow Springs, but as for the race itself, I don't remember a thing about it." New! (1-14-09) Photos From Bob Harris's Personal Collection! Link! Harris leading at Stockton in April, 1962. New! More Campbell Special photos! Video! See the Campbell Special in action at Santa Barbara in May, 1962.